Welcome, fortune seekers! 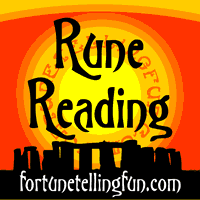 Call upon the divinatory power of the runes to read your future and learn your destiny with our free rune reading. Simply select your favourite rune bag and rune spread, then clear your mind and concentrate on your question. Thank you for using our completely free online rune reading. We offer readings using both the early Elder Futhark runic alphabet, and the later Anglo Saxon alphabet. Numerous spreads are available to the questioner, including three classic rune spreads: Odin's Draw; a single rune, Odin's Spread; a spread of five runes, and the Norn Spread; a spread of three runes. The runes in Odin's Spread and the Norn Spread represent the past, present, and future. Both castings are used to interpret situations over time and predict future events. Calling upon the divinatory power of the runes is an ancient tradition. Historically, the Germanic people believed in the magical significance of the runes, and in addition to writing, used them for various forms of divination and as a means of reading omens. Modern divination systems based on runes began in the 17th century when Hermeticist and Rosicrucian Johannes Bureus developed a Runic system based on the Kaballah and the Futhark which he called the Adulruna. Sometimes not knowing our path through life can be a source of confusion. The runes give simple answers to life's complex questions. How the questioner chooses to interpret the runes may help them gain fresh insight into their past, their future, and their loved ones. This free rune reading page has been online in one form or another since 2002, when it was one of the first ever rune readings available on the internet.